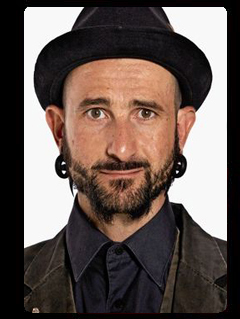 John Vlismas Biography Born 1973 in Zimbabwe and moved to South Africa to become a stand-up comedian and an entertainer promoter. John Vlismas won the 2007 South Africa Comedy Awards as the best one-man show as comedian of the year. John Vlismas went to Durban University of Technology where he graduated in 1993 with a national diploma in Drama. John Vlismas is the director of Whacked Management and is the co-owner of Virus Communications. He is also renowned for all his comedy shows such as “Aggravated Assault” (1999), “POW” (2009), “Lucky Plebian” (2008), and many more. He has taken part in the Laugh Out Loud show and performed for 7000 people nationwide. John Vlismas starred in several films such as Laugh Out Loud, Footskating 101 – The Movie, Slam-Bang, Outrageous and Crazy Monkey Presents – Straight Outta Benoni. Vlismas is the only South African comedian to perform at The Royal Albert Hall, The Hammersmith Apollo and The Lyric Theatre – Shaftesbury Lane. John Vlismas performed at The Best of The Fest showcase in both Montreal and Melbourne Comedy Festival. He was the first South African comedian to perform on the Comedy Central series called Comedy Central Presents – Live at Parker’s in 2012. John Vlismas has travelled across the globe to various countries and has made four trips to Canada for Montreal’s Just for Laughs Festivals and is the only South African comedian to ever get invited back three more times having impressed Club Soda, Globecom and Bubbling with Laughter. He performed by invitation in the prestigious showcase Talk to the Fest with Drew Carey.